Before we go into the details of producing small amounts of Biodiesel at home we must first stress the importance of safety. The chemicals used in the process of making Biodiesel are dangerous and if used without taking the correct measures to protect yourself can cause serious injury or even death. Please, please be careful and make sure you are in a well ventilated area with access to running clean water. NaOH (lye / caustic soda), at least 6g. This is often used as a drain cleaner and can often be found in your local supermarket. If you are using new vegetable oil it should not contain any water so just heat to 55deg c when you are ready. Take 250ml of Methanol and add 4g (about half a Teaspoon) NaOH. Methanol and NaOH do not easily mix. Start with the methanol at body temp (not warm). 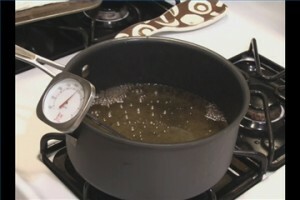 NOTE that as you mix the two chemicals the temperature will increase. Do not panic… is normal. You will need to ensure all the NaOH is disolved in the Methanol, this could take over ten minutes. When the Oil’s temperature has dropped to 60 deg c or less, using your funnel, pour the litre of oil into you dry plastic container. Take your methanol/NaOH (Methoxide) and add to the oil. Ensure the container is sealed securely then shake vigerously for about 15 seconds. Leave your Biodiesel to “set”. You will notice that after about 10 minutes the glycerine or “soap” will settle from your mixture. It will take a day or two for the Biodiesel to completely separate. You will see two defined layers – the Biodiesel and the glycerine.Typically the glycerine layer is about the same or a bit more than the amount of methanol used. Although the glycerine or “soap” and water has separated from your Biodiesel – it will still need washing. Please do not violently shake your unwashed Biodiesel as it will form an emulsion that may take days or evn weeks to fully seperate. The gentle approach is whats needed. Pour 1 litre biodiesel into a a clean and dry plaric bottle. Gently pour in 500ml water (body temp). Now GENTLY rotate the bottle end for end for about 30 seconds. After 30 seconds place bottle upright. Only If you have been GENTLE the water and Biodiesel will seperate immediatly. You will notice the water is not clear. Remove top and using your thumb as a stopper, turn bottle upsidedown and drain the water using your thumb as a valve. You have finished wash one. Pour in another 500ml water and repeat wash one, except rotate GENTLY for about 1 minute. Drain as in wash one. You have finished wash 2. Again pour in another 500ml water and GENTLY GENTLY GENTLY shake bottle for a minute or so. When water and biodiesel seperate discard water in same fashion as before. Another 500ml water and a bit more aggitation for about 1 min. After seperation of water and biodiesel Drain as above. You should now be able shake fairly vigerously. If the washing has been completed sucessfully the water should be almost clear. Be aware that in your later washes you should be able to shake mre violently although it will take considerably longer to seperate because the water forms tiny bubles in the biodiesel that take time to settle out. You must remove all that water from your biodiesel before using it in a diesel engine or risk damaging the engine. The oldest method of drying is settling. In this method the water settles to the bottom of the tank or container over time and can be sucked out using a small pump or syphon. 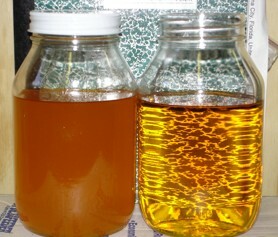 For small batches it can take up to a day for the water and biodiesel to completely separate. Over time the water will evaporate out of the biodiesel however if let in a muggy or wet environment this may not be suitable. Once the water has all be removed you Biodiesel is now ready for use! Enjoy! Please feel free to refer back to the process chart below. 1 Pings/Trackbacks for "Make Biodiesel at Home"